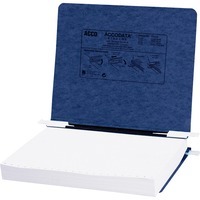 Hanging data binder features Presstex covers and storage hooks to secure up to 6 of unburst sheets. Design is top loading and bottom loading. Acrylic coating on binder provides a water resistant cover. Retractable filing hooks are designed for both single point filing and a drop file system. These flexible nylon posts adjust to hold up to 6 of sheets attached in continuous form. Data binder accommodates the following center posts 10 12, 9, 8 12, 8, and 7.